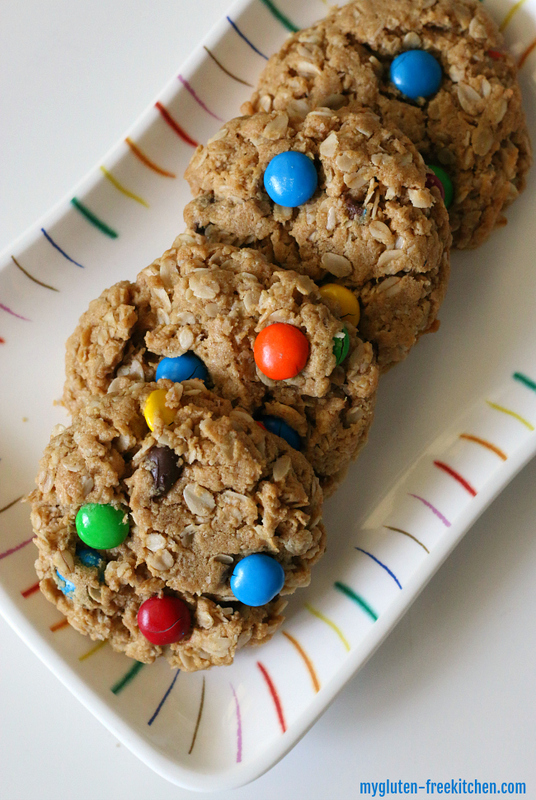 A family favorite for years, these gluten-free monster cookies are chewy cookies that are chock full of peanut butter, gluten-free oats, chocolate and M&M’s. 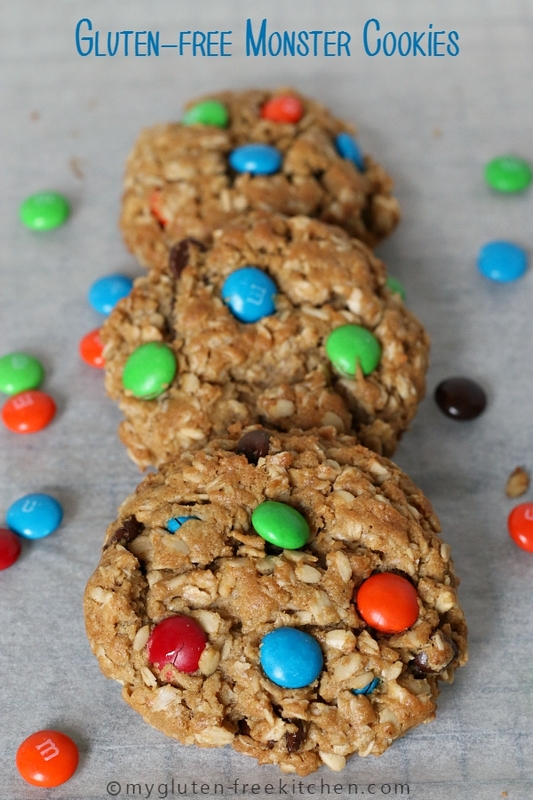 This easy, flourless monster cookie is one that I love to whip up to have on hand for after school treats! 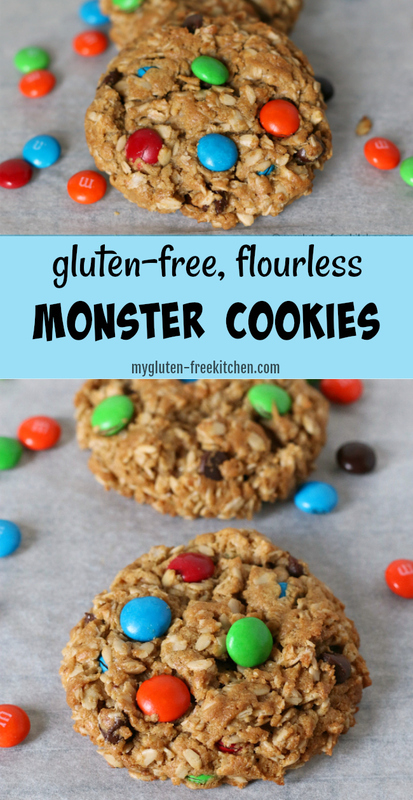 Gluten-free monster cookies are a staple at our house. I made these cookies for many years before needing to go gluten-free, and they were one of the easiest recipes to switch to gluten-free since they don’t have any flour in them. Just use gluten-free oats and verify that all other ingredients are gluten-free like they should be, and these are easy as can be! Why are these called Monster Cookies? Honestly, I have no idea why these have always been called Monster Cookies. Maybe the person that coined that term was making each cookie really huge too? I make mine approximately palm-sized, but you could go bigger or smaller, just adjust baking time a bit! With whole grain gluten-free oats, and protein from the peanut butter, I feel good about having these for a snack. I even had a friend bring these to me when I was nursing my baby, recommending them as a great snack to keep my energy and blood sugar up between meals. Seriously, it doesn’t get much better than a friend bringing you delicious cookies and encouraging you to eat them for your health! I’ve brought them to new moms, playdates, and just last week, to our small group from church. Kids and adults all love these! The recipe makes 3 dozen cookies, so you have plenty to share! If you need dairy-free, you can use Earth Balance buttery sticks, Melt buttery sticks, or I think coconut oil would work just fine, though I haven’t tested that yet since I’m all about the real butter! If you need to avoid peanut butter, you can a nut butter or SunButter. I’ve made these with regular Jif or Skippy , Jif Natural peanut butter, Skippy Natural peanut butter or Trader Joe’s brand natural peanut butter – all with great results. For the oats, I recommend GF Harvest gluten-free organic rolled oats. or GF Harvest gluten-free quick oats. The quick oats are definitely finer, while the rolled oats give a heartier texture. You pick! I’ve tested both with great results. I buy mine from Amazon and have linked to them there. For the chocolate chips, just be sure you are using a brand that isn’t manufactured on shared equipment with wheat. I love Guittard brand semi-sweet morsels which I buy at Winco, and for dairy-free I use Enjoy Life semi-sweet mini chips or mega chunks, which I buy at Amazon. I only use plain milk chocolate brand name M&Ms which I’ve previously confirmed are gluten-free and are not made on shared equipment with wheat. If you are wanting to use a generic or another flavor/variety, you’ll need to investigate their safety. I’m not aware of a dairy-free equivalent for M&M’s that is not made on shared equipment, so if you need to be dairy-free, I would just skip the M&Ms and use double the chocolate chips. It’s fun to switch these up for the holidays by using holiday colored plain M&M’s too! I’ve used all red and pink for Valentine’s day, or all green and red for Christmas. I’ve even been known to use all the orange and blue ones to make these for a Boise State Football party! BOISE! Looking for more cookie recipes that use peanut butter? Check out my gluten-free double peanut butter cookies – they’re so soft and yummy! If you’re looking for a flourless option like these, then you might like these flourless, sugar-free gluten-free peanut butter cookies. If you’d like a vegan option, try these vegan peanut butter chocolate chunk cookies. So many yummy options! If you’ve got a favorite cookie that I haven’t shared a recipe for yet, be sure to let me know! Also check out my Pinterest board full of gluten-free cookies! 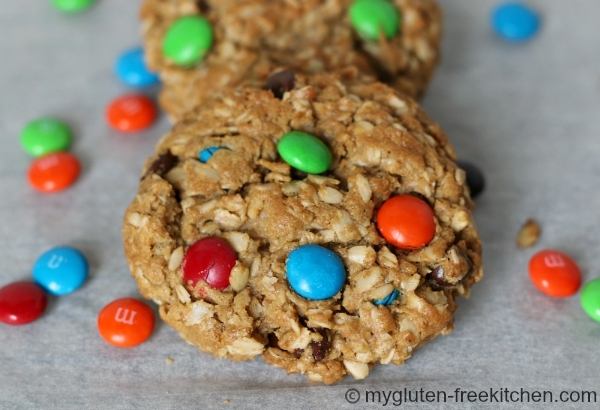 A family favorite for years, these gluten-free monster cookies are chewy cookies that are chock full of peanut butter, gluten-free oats, chocolate and M&M's. In the bowl of your electric mixer, cream together butter, sugars, peanut butter and eggs until light. Add baking soda, vanilla extract, and gluten-free oats and mix on low speed until well mixed. Stir in chocolate chips and plain M&M's. Use a large cookie scoop to scoop rounded balls of dough and place on lined cookie sheets, leaving space between them for them to spread. I only do 12 per cookie sheet, less if using a smaller sized sheet. Place in preheated oven. I usually bake one sheet at a time, but if you want to bake two sheets, be sure to set a timer for halfway through so you can rotate the sheets both top to bottom and front to back. Bake at 350° for 12-15 or until they don't look gooey in the center. If your cookies seem very tall/thick, you can use a spatula to flatten them just a bit so they'll cook a little more evenly. These are better slightly under-cooked than overcooked. I recommend baking a test cookie to see how many minutes it will take for your oven. Remove from oven and leave on the cookie sheet for a couple of minutes before moving cookies to wire racks to cool. Store in airtight container at room temperature. These freeze really well, so feel free to stack and pack them in a Ziploc freezer bag after they've cooled completely. Please see blog post for recommended brands and substitution suggestions. 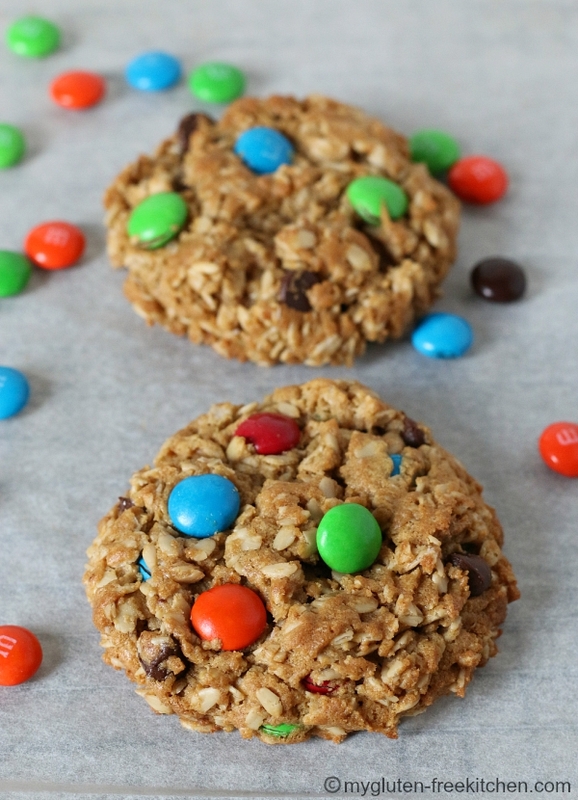 It’s hard to beat the visual appeal of M&Ms in cookies, bars, and bites! I’ve seen them in all and, understandably, they always get plenty of attention. The good thing is there always seems to be lots of oats to balance the treat factor. 🙂 Thanks or linking up to Gluten-Free Recipe Fix! I love and appreciate how you consider all possible dietary needs, including peanut free, dairy free butter, etc… I can’t wait to try these cookies and many of your other recipes! Thank you Danielle! I do try! Hope you can try these soon! I make these cookies all the time. They are delicious! Even my friends who do not have to be gluten free love them! These were easy to make and delicious. I loved baking before my son was diagnosed with Celiac Disease. Its recipes like this that make everyone in our family happy! I have a work potluck tomorrow and I am determined every month to make them something they never would have expected. Now I have been craving gluten free cookies but I prefer to omit flour replacements and find ways to make foods with the least amount of ingredienst. These were delicious and easy to make. My daughter can’t have eggs so I did a mixed egg replacement. We 1/2’d the recipe so for 1 1/2 eggs we did 1/4 cup of applesauce mixed with 1/4 tsps of baking soda (for 1 egg) and 1 tbs flax meal with 2 tbs warm water as 1/2 egg. We set both aside for about 5 minutes before adding into the mix. Turned out great! We did just a touch more oats since we had so much wet stuff. Did you really make these with Trader Joe’s Natural Peanut Butter, as in just Peanuts and Salt? I have yet to see a recipe suggesting TRUE natural peanut butter, the kind without the extra oil and added sugar. I only had TJ’s crunchy PB in the house, so I used my husband’s creamy skippy. My girls agree that the cookies are delicious! I’d love to try natural PB next time. I made this recipe with smuckers natural creamy peanut butter. They were great! I made with dark chocolate chunks and craisins!! Great switch up !! Can you sub maple syrup? Honey? I’m looking for less sugar! Made these cookies for a teacher luncheon at my kids school. There are a couple teachers that are gluten free. Everyone commented on how good the cookies were. One of the teachers that is gluten free said it was the best gluten free cookie she has ever had. Thank you for sharing the recipe. Sara, I’m so happy to hear that! That was sweet of you to make them for the teachers and I’m so glad they enjoyed them! Have you ever tried making these with Coconut Sugar? I, too am trying to lower the sugar level or at least lower the glycemic index number. Thanks! Stef, I haven’t but these would be a recipe that I think would work with that! Give it a shot! These were amazing! Made me feel like I was eating “real” cookies once again. Now I can indulge in a delicious dessert with friends. Thanks for a great recipe. I’m so glad you enjoyed these Jen! Thanks so much for taking the time to comment and rate these. It is appreciated. These monster cookies are amazing!! My son cannot eat gluten and sometimes it’s hard to find a truly yummy alternative. I love that it’s just oats – no expensive or nutrient-lacking GF substitutes. YUMMY! Thanks for this simple, delicious recipe! You’re so welcome! Thanks for the 5 star rating and compliment!So glad your son enjoyed them and you enjoyed the ease of ingredients! Those look really good. And what a day I’ve had. I could really use a cookie! Fantastic! I added milk and dark chocolate chips and used peanut butter M & Ms because that’s what I had on hand. I also substituted some of the regular peanut butter for honey roasted peanut butter and cut back a bit on the sugar. Used coconut and turbinado sugar. No one knew they were GF and everyone loved them. This recipe will definitely be added to the rotation. Made these Dr my grandson coming over this week. They turned out great. He’s going to love them. Nana loves them too. I appreciate your recipes being so easy to follow. Yes, feel free to push them down some! I saw this recipe and I had to make it. When I was a kid M&M cookies with something we made every Christmas. Tis the season and I hadn’t had them in a really long time so I was really excited. I bought the M&Ms without the dyes, I think the brand is Sunspire? I followed the recipe almost exactly but instead of white sugar I use coconut sugar since that’s all I had. I use the fresh ground peanut butter from the grocery store so not exactly crunchy and not exactly creamy. When I got to the point where I was adding the M&M’s and the chocolate chips my 6 quart stand mixer which is still fairly new almost conked out on me. The batter was super stiff. I’ll review the ingredients list and feel very certain that I didn’t make any errors there. Anyway I only was able to add the M&M’s. I didn’t dare add the chocolate chips and risk bringing up the mixer and I’m not into kneading by hand. I proceeded to bake it was a little disappointed that you cannot see the M&M’s at all and I’m just not sure how adding the chocolate chips as well would have made that much of a difference in whether or not you can see the M&Ms so they didn’t have the visual appeal that I was hoping for. They do taste pretty good. I baked 14 minutes and when they are cool they are slightly crispy which is my preference.